Xcelsius running natively on the Android device: The dashboards shown in the demo were built for PC viewing, however they render just fine on the Tablet. Innovative solution for Mobile devices. Can’t wait to see it in production. Posted in: Mobile, Videos, Web Intelligence, Xcelsius 2008. I’m very excited about using Xcelsius on the galaxy tab. I was just thinking about this on the commute home. Nice to see it in action! This is perfect timing to see something like this where a quality engineering effort was invested to integrate Xcelsius for mobile use. Congrats to Mark and the Antivia team for a job well done! can i upload it to an ipad or iphone? 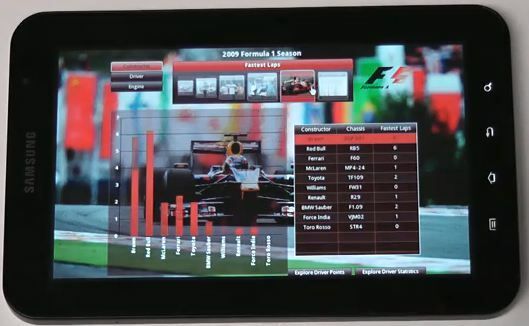 Dashboards mainly based on flex and other RIA technologies are already available in IPADs and other android tablets. You can watch a demo of it in youtube – http://www.youtube.com/watch?v=RaRc2-A9IQ4.